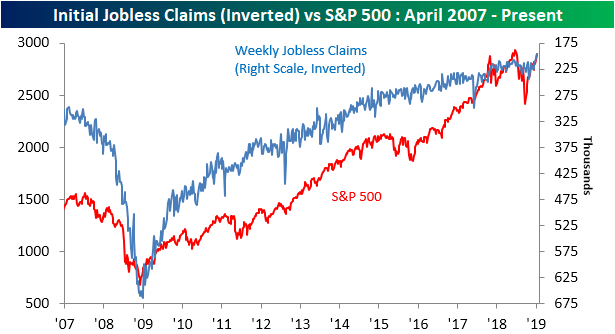 Earlier today on our Twitter account, we retweeted a chart from Bloomberg’s Joe Weisenthal of inverted Jobless Claims versus the S&P 500. We have used this chart as an argument for the bullish case for the past several years. As we mentioned in a blog post this morning, Initial Jobless Claims came in earlier this week with a sizable drop off, down to 196K versus last week’s revised 204K and expectations of 210K. This week’s print was not only a new low for the current cycle, it is also the lowest reading since 1969. That sort of new low could be a good sign for equities. As shown in the chart below, claims and the S&P have mirrored each other since bottoming following the financial crisis. (In the chart, we have inverted claims on the right axis.) As the S&P 500 inches its way back towards all time highs, so has claims towards new lows. Additionally, with recent low prints for claims bucking what had previously appeared to be an upside trend reversal, the bullish case for the S&P 500 is growing.